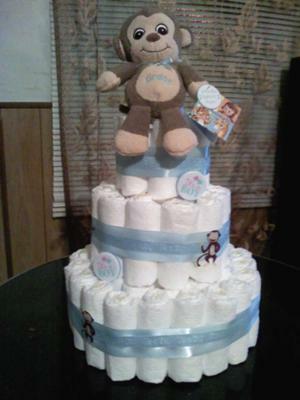 This cute little monkey diaper cake was shared with us by Cody from Tennessee. Her cute Monkey cake topper is so adorable! Cody is adding her creativity and ideas to our fabulous diaper cake gallery. We have the best collection of diaper cake ideas on the internet because of our readers like Cody. Thanks so much for sharing, Cody! right here to send us your ideas & photos. I never heard of diaper cakes until 3 weeks ago. so i decided to make my cousin one. this is her first baby. she liked monkeys so i decided to go with that as my theme. i made my first diaper cake it was an inexpensive gift to make.